Unfavorable opinions of Chuck Hagel have increased over the past month as he has faced a bruising confirmation battle to become President Obama’s secretary of defense. A national survey by the Pew Research Center, conducted Feb. 14-17 among 1,003 adults, finds that 22% have a favorable opinion of Hagel while 28% have an unfavorable view; 50% express no opinion about the former Nebraska GOP senator. A month ago, shortly after his nomination, opinions about Hagel were divided: 18% had a favorable view, 17% an unfavorable opinion and nearly two-thirds (65%) had no opinion. Over this period, the percentage holding a very unfavorable opinion of Hagel has nearly doubled – from 7% to 13%. Currently, more than twice as many Republicans view Hagel unfavorably as favorably (36% vs. 15%); 48% have no opinion. In January, 15% viewed him favorably, 26% unfavorably, and 59% expressed no opinion. Views of Hagel are particularly negative among Republicans and Republican leaners who agree with the Tea Party: 48% view him unfavorably, including 26% very unfavorably, while just 15% have a favorable view. Among Democrats and independents, the balance of opinion about Hagel also has grown more negative. Currently, 31% of Democrats view Hagel favorably while 23% view him unfavorably; 46% still have no opinion. In January, two-thirds of Democrats expressed no opinion of Hagel; among those who had an opinion, favorable views outnumbered unfavorable opinions by two-to-one (23% to 10%). 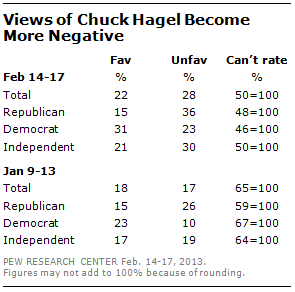 Independents’ views of Hagel also have turned more negative over the past month. The survey also finds that the public expresses mixed views of Marco Rubio, following his response to Obama’s State of the Union address. Overall, 26% view Rubio favorably, 29% unfavorably, and 46% cannot offer a rating. Rubio has a strong image among Republicans and receives particularly high ratings among those who agree with the Tea Party. Among all Republicans (and Republican leaners) who agree with the Tea Party, fully 70% view Rubio favorably compared with just 7% who view him unfavorably. 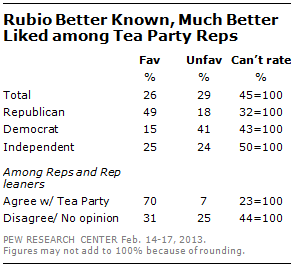 Among Republicans and leaners who do not agree with the Tea Party, 31% view Rubio favorably and 25% view him unfavorably. Newly confirmed Secretary of State John Kerry is widely recognized by the public, with 78% able to express an opinion of him. Kerry is viewed, on balance, more favorably (45%) than unfavorably (33%) and positive views of him have ticked up six points since early January. A majority of Democrats (64%) view Kerry favorably compared with just 18% who hold an unfavorable view. Independents are divided, with 42% viewing the former Massachusetts senator favorably and 36% unfavorably. Nearly twice as many Republicans view Kerry negatively (55%) than positively (29%). The debate over gun control in the U.S. and the California manhunt for the former police officer accused of murder were the public’s top news stories. 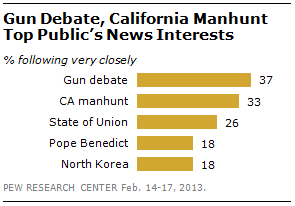 Nearly four-in-ten (37%) say they followed the gun control debate very closely. Interest was comparably high among Democrats (43% very closely) and Republicans (39%). A third (33%) followed news about the police manhunt for the former police officer accused of murder, including 41% of those living in the West. The public paid less attention to Barack Obama’s State of the Union address (26% very closely). Democrats (46%) were much more likely than independents (18%) or Republicans (14%) to have followed news about the president’s address. About two-in-ten (18%) paid very close attention to Pope Benedict announcing that he would step down as head of the Catholic Church. Nearly four-in-ten (39%) Catholics followed this news very closely. North Korea conducting a nuclear test garnered little public attention: just 18% followed news about the nuclear test very closely.